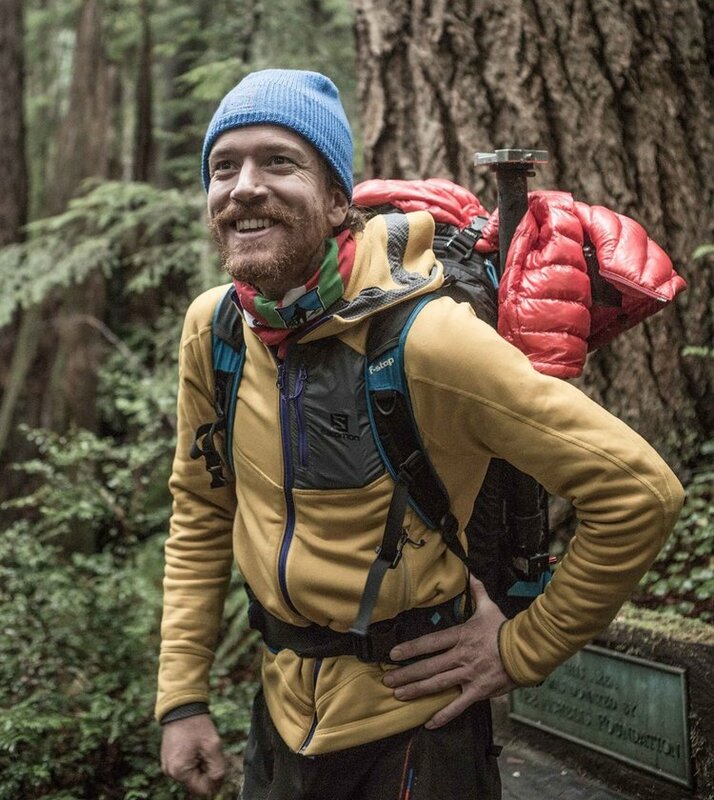 or Colorado native Rickey Gates, running is a tool in “the search for a freedom that our bodies, our minds, and our environments can provide.” That search has led him to more than 30 countries around the world, including a 3700-mile coast-to-coast run across the United States. Rickey has been called “a modern-day, mountain-running Kerouac” for the thoughtful way he chronicles his journeys through photography, video, writing, and multimedia projects like Every.Single.Street., in which he invites runners to get to know every street in their community. on his running retreat with Aire Libre in February / March, 2019. When we caught up with Rickey at a rare moment of cell signal on a road trip through Baja California with his girlfriend, he spoke to us about adapting his running routine for the road, what makes pulque and carnitas the ultimate running fuel, and why he keeps being drawn back to Mexico. We know you’re on an epic road trip right now. Tell us more about that and paint a picture of where you are writing from. – I’m writing from Bahía de los Ángeles in Baja California, sitting in the back of my little van, getting ready to go to sleep for the night. My girlfriend, Liz, and I tried to pick a quiet spot in town to park the car, but the music has started up alongside us, which is just as well—it’s kind of soothing. We’ve been making our way down Baja for the past several days and will continue on to Cabo San Lucas and up to to La Paz before crossing over to the mainland before long. Liz and I have been talking about doing a long trip like this for some time now. The end of a job for Liz, the end of a project for me, and the prospect of a new home base has made this the perfect time for us to tackle an experience such as this. How much running will you be doing on this road trip? Do you find that you have be intentional about incorporating running into travel, or is it just embedded into your lifestyle at this point? – I am running as much as I can and as much as makes sense. I am careful to maintain a balance when traveling. Though running is a central part of my life, I have found that if taken too seriously, it can actually take away from a much richer experience if that is one's sole focus. Today, it made sense to trade back and forth with my girlfriend while she drove and I ran and then I drove and she ran. Not every day holds this possibility, though. And what does your usual running routine look like when you’re at home? My routine used to be very strict: I would have workouts and run every day. I used to write down all of my miles and feelings and all that. I don’t do that anymore. It is much more about feeling. I don’t run every day. I receive a great amount of enjoyment from mountain biking and swimming and sitting (yes, sitting). There are some days when it simply makes sense to not go running. But this has been a journey of over two decades now. I cherish all of the little epochs that I have experienced through this “sport”. How do you eat well on the road? –I follow my nose! I’m really not an obsessive eater, so this isn’t much of an issue for me. I try not to eat too much sugar or too much meat. Furthermore, I find that most societies that have a limited diet based on what’s available to them actually eat much better than I do at home. Now, of course, with globalization, I find this to be changing some. Sugar is a drug and until it is labeled as such, we will never truly appreciate how powerful it is. – I personally feel that Mexico has one of the best cuisines for runners adjusted to a high-fat diet. Though I would like to one day lead a mostly plant-based diet, carnitas, chicharrones, and fish tacos are super ideal for a slow-fuel-burning diet. Oaxaca, though, holds a completely different diet—my favorite in all of Mexico, if not the Americas: tlayudas, chapulines, mole, and so much more. To answer this would be no different from answering how a person makes me feel. If that person is capable of allowing me to reach the inner depths of who I am, then they are able to make me feel happy, sad, tired, angry and so much more. Though I love running, I truly believe that it is the act of doing one simple thing, year after year, decade after decade, that allows us to observe this growth. You’ve written a lot about your running experiences. How do running and writing intersect for you? – I have always been fascinated by people—in the university, I studied sociology and photography, and I dabbled in writing. Being a runner simply allowed me access to a specific type of people and a pure narrative to work from. When I started combining my travels with running nearly a decade ago, I really wanted a way to express myself. I asked Trail Runner Magazine (conveniently based near my hometown in Colorado) if I could write an article about traveling and racing in Europe. They really liked the idea and I have subsequently written a dozen feature articles for them and maintained a column for a couple years, writing about running through Northern Mexico’s Copper Canyons, Uganda’s Mt. Elgon, and the Ultra-Trail du Mont-Blanc. Having this avenue to express myself makes me observe the world differently when I travel, race, or train. This isn’t your first time in Mexico, right? – My first time to Mexico was when I was 23 years old. I bought an old motorcycle and thought I’d try riding it all the way to Tierra del Fuego at the southern tip of South America. Did you make it all the way? – I did indeed! I was away from the States for eight months. Four of those months were spent on my motorcycle through 12 different countries, the other four months I spent studying in the coastal town of Valparaiso, Chile. It was an amazing journey that left an indelible mark on my memory. It illuminated both the similarities and differences between Mexico and America. In the States, we can have a very biased view of Mexico (and I would argue that the same can be said of America in Mexico). In experiencing these places firsthand, we can come to our own conclusions. What keeps drawing you back? – One of the things that keeps drawing me back to Mexico is the diversity of the country. We, as Americans, oftentimes think of just one Mexico. But in reality, Baja is as different to Mexico City as Texas is to New York City. – My best friend from high school and I flew to Mexico City some years back. We had heard that there were a great many trails surrounding the city, going to the top of the volcanoes. We spent a week running around La Malinche, Nevado de Toluca, and Valle de Bravo, rehydrating with pulque and mezcal. I had avoided Mexico City multiple times in the past, partially because I am not a big fan of cities. We were truly blown away by the beauty and remoteness of these mountains, so close to the largest city in the Americas. I wrote a story about the experience for Trail Runner. Why did you select Oaxaca as the destination for your Aire Libre running experience? – I have had a long relationship with Oaxaca: when a friend, Richard Betts (founder of Sombra Mezcal, whose distillery we’ll be visiting on the retreat ), started bottling Oaxacan mezcal for sale in the States, he asked if I would join him. I saw an amazing side of the city and state on that trip and hoped that I’d be able to do some sort of running project there in the future. This is truly coming full circle. What are you most looking forward to down there? What lessons from other running projects will you bring to the experience? – I guide a couple other running trips with Hut Run Hut and Bus Run Bus. I love how a small group of people can really come together with the excuse to run. This will be my first time joining a group outside of the United States and I am particularly excited and curious about the various cultural and mindful practices that will be pursued in Oaxaca. I’m psyched to see everyone down there!